Body clocks are the internal mechanisms that keep your body healthy and operating at maximum efficiency. These biological clocks help you feel alert during the day, hungry at mealtimes, and sleepy at night. Keeping your body’s daily cycles, or circadian rhythms, in sync is important for your health. Circadian rhythms are big influencers in the body. They affect almost every part of your physiology in one way or another. To maintain your health, it is important to understand how your body clock works. 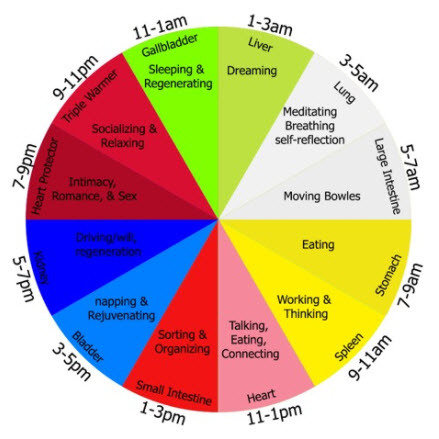 Many of your body’s normal daily activities, like sleeping, waking, and eating, are patterned around this 24-hour cycle. Your biological clocks “settings” are determined by specific genes. These settings can affect body temperature, blood pressure, activity level,and inflammation. Mood and brain functions are also affected. Even the timing of health-related events can be related to your biological clocks. For instance, heart attacks are more likely to occur early in the morning, when the hormone cortisol starts its daily rise. Researchers have found that eating later in the day, closer to when melatonin is released, can disrupt the body’s natural rhythms. This can lead to increased body fat and weight gain, which are often associated with obesity, heart disease, and diabetes. For instance, shift workers who must be on the job after the sun goes down are fighting their biological clocks. They may be tired at work and have trouble falling or staying asleep during daylight hours after work. Studies show that shift workers have increased risk for heart disease, digestive disturbances, cancer, depression, and other health problems. Moreover, traveling across time zones can also disrupt your circadian rhythms. The brain has trouble adjusting when the time of day suddenly changes. The result is jet lag. Researchers are considering time of days affects on body clocks in all aspects of health. This even includes the best time to have surgery on specific parts of the body. These studies may lead to new insights for a range of clock-related disorders, from insomnia and jet lag to diabetes. Maintain a correct and regular schedule of activities to optimize your health and stay disease free.